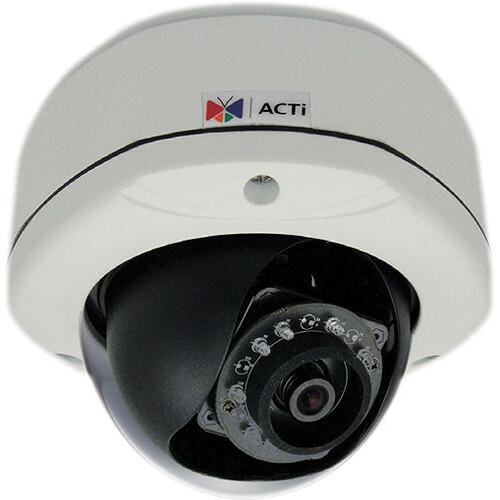 The 2MP Outdoor Dome Camera with Night Vision from ACTi utilizes a 1/2.8" progressive-scan CMOS sensor to capture video in 1920 x 1080 resolution at 30 fps, and it features a 3.6mm lens for an 87.5° horizontal field of view. Ten integrated IR LEDs enable the camera to capture video at a distance of up to 98.4', even in complete darkness. Additionally, WDR (Wide Dynamic Range) and a mechanical IR cut filter enable the camera to capture clear images in ambient lighting. H.264 and M-JPEG formatting maximizes your storage and bandwidth usage, and a microSD slot supports memory cards for on-site recording and edge storage. The camera features motion and sound detection as well as a number of alarm responses, including sending an email with a snapshot of the detected movement. Pan, tilt, and rotate adjustments can be made during installation for multiple viewing options, and privacy masking can be configured in four separate areas of the viewing field. The camera is ONVIF compliant, enabling compatibility with a variety of other surveillance devices. With its IP67-rated weatherproof and IK10-rated vandal proof metal enclosure, the camera can be installed outdoors and in high-risk areas. Additionally, PoE technology enables you to set up the camera using just one RJ45 cable, simplifying your installation process. Box Dimensions (LxWxH) 7.9 x 7.9 x 7.1"
2MP Outdoor Dome Camera with Night Vision is rated 2.0 out of 5 by 1. Rated 2 out of 5 by George from Completely manual pan/tilt It's difficult to see from the specs, but this is a completely manually adjustable camera. Need to open the dome, and manually aim the camera. No remote pan/tilt. I'm giving it two stars because the one we received came up and talked to the browser, and appeared functional, but the video stream was completely blank. Never did get a picture from it. So I can't really tell if it was defective, or had an interface issue. Returned it for a different camera because of the manual pan/tilt.